Claims that pregnant mums who exercise may be boosting their baby's intelligence have been reported across the media. The popularity of this story has probably been driven by the accompanying picture of a cute baby, sucking a dummy while covered in electrodes. Researchers are said to have randomly assigned an indeterminate group of women in their first 12 weeks of pregnancy to either moderate exercise for a minimum of 20 minutes, three times per week, or no exercise. 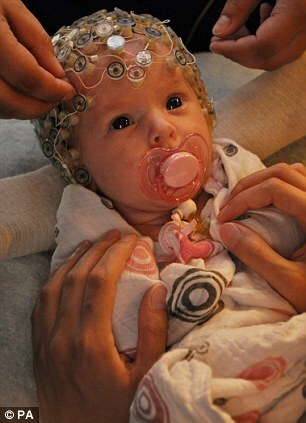 When their babies were 8-12 days old, their brain activity was measured using electroencephalography (EEG). The area of amplitude (the degree of change) in the wave activity of the EEG was generally smaller in babies born to active mothers, which is said by the researchers to indicate heightened maturity. There was also increased activity in a region of the brain involved in memory, speech and language. It is important to stress the media reports are based on a conference abstract; a very short summary of the research which has not yet been peer reviewed. Therefore it is not possible to comment on the quality and reliability of this research. Overall, even if the research does turn out to be well conducted, a single, one-off measure of a baby’s brain activity cannot tell us whether this will be associated with any difference in brain ability as they grow into childhood and adulthood. The media reports follow publication of a conference abstract in the journal Neuroscience of a trial entitled “Foetal brain development is influenced by maternal exercise during pregnancy”. The study has been conducted by researchers from the University of Montreal in Canada. No information on funding is provided. The media is extremely premature in hailing the findings of this conference abstract. Taken alone at the current stage in publication, this conference abstract does not provide evidence that exercise boosts a baby’s brain development. Even if these were positive results from a final publication in a peer reviewed journal there are significant limitations. The fact that babies only had their brain activity examined once at 8-12 days of age gives no indication of how these babies are going to develop. It is also unclear whether brain activity at this very early stage would have any lasting influence on intelligence through childhood and into adulthood. This was a randomised controlled trial that aimed to investigate whether an active lifestyle during pregnancy has an impact on the newborn’s brain. The conference abstract says there is accumulating evidence that an active lifestyle can boost the brain power of children, adults and the elderly. The researchers also reported that recent studies in pregnant rats found that rat offspring with more physically active mothers demonstrated more nerve growth in certain areas of their brains. There are difficulties in critically appraising the study at this stage. It is currently only available as a short summary known as a conference abstract, which has not yet been published in a peer-reviewed journal and contains very limited information. For instance, it doesn’t say how many women took part in the trial, which is a fundamental detail in assessing the results. Without full study information being provided, it is not possible to comment on the quality of this research and whether its results are reliable. What we can say is that any definitive conclusions drawn from this conference abstract in the media, are premature. Limited methods are reported in the conference abstract. The authors say that women joined the study during the first trimester (first 12 weeks) of their pregnancy and were randomly assigned (method not given) to an active or a sedentary group. The active group was asked to exercise a minimum of 20 minutes, three times per week, at a minimal intensity of 55% of their maximal aerobic capacity (method of determining this not given). It was said that the sedentary group “did not exercise”, but no information is given to describe how it was known they did nothing (also, actively encouraging pregnant women not to exercise could be unethical, given what we know about the benefits of exercise during pregnancy). The authors say that when the newborn was 8-12 days old they used an EEG (electroencephalogram) to look at the baby’s brain activity and see what effect exercise during pregnancy had on the newborn’s brain. They measured “mismatch negativity” (MMN) – which is the brain’s electrical response to auditory stimuli. In this study it appears they assessed MMN by differences in response to previously “learned” sounds (sounds that the babies had previously been exposed to) and “new” sounds. They calculated the average difference wave for the MMN for newborns in both groups. The exercise group performed an average of 117 minutes of moderate intensity structured exercise per week, compared with the sedentary group who performed 12 minutes per week. The babies in the exercise groups appeared to discriminate between the new sounds and the learned sounds more efficiently. This was interpreted as a sign of increased maturity. There were also differences between the two groups in brain activity during sleep over the left temporal region. Babies in the exercise group had increased activity in the temporal region; an area of the brain involved in memory, speech and language. The researchers concluded: “Exercise during pregnancy had an impact on the newborn’s brain … the positive wave with a smaller area amplitude in the active group suggests heightened maturity. To better understand the functional significance of our findings, children from this study will undergo developmental testing at age one”. This is a conference abstract only that has not yet been published in a peer-reviewed journal. Very limited detail is given on the trial, and without full study information provided, it is not possible to comment on the quality of this research and whether its results are reliable. Overall, even if the research does turn out to have been conducted in an adequate number of women and to have reliable methods, there are still significant limitations. A single, one-off measure of a baby’s brain activity when they are just over one week old cannot tell us how their brain will develop. It is uncertain whether levels of activity at this age will be associated with any difference in brain ability as they grow into childhood and adulthood. Because of this, the media reporting of the study is premature, and potentially misleading. That said, exercising during pregnancy is recommended. It may not make your baby more intelligent but there is evidence that it can help reduce the risks of complications in later pregnancy and during labour. Read more about the benefits of exercises in pregnancy and the safest ways to exercise.